Better, quicker, faster? Here’s a look at the meaning of and differences between “expedited” shipping with different providers. Have you ever been confused about which shipping service to use in the marketplace? If so, you’re not alone. Naturally, your buyers want their items quickly — and, if possible, shipped free or at the lowest cost available — so the shipping service you choose can directly impact your seller feedback, overall customer satisfaction and your bottom line. What’s more, the marketplaces tend to have different ways of classifying their shipping options — meaning what’s called expedited at Amazon may not be exactly what eBay considers expedited. Some marketplaces, like Amazon, specify a delivery time, not service, so if you’ve promised 2‑day shipping, its up to you to choose the shipping service to make it happen. To further muddy the waters, “expedited” may not even refer to a marketplace’s fastest shipping service. With next‑morning and same‑day shipping available, that “expedited” option could in fact take longer and cost you extra days — and possibly customers. Here’s what you need to know about the differences in these levels of service, and how you can best communicate shipping expectations to customers. The following table provides a quick look at the offerings of USPS, FedEx and UPS; always check directly with the shipper for any changes in services, names or costs. USPS USPS Priority Mail Express One‑day shipping One‑Day U.S.
USPS USPS Priority Mail Express Flat Rate Envelope One‑day shipping One‑Day U.S.
UPS UPS Next Day Air Saver One‑day shipping One‑Day U.S.
UPS UPS Next Day Air One‑day shipping One‑Day U.S.
FedEx FedEx Priority Overnight® One‑day shipping One‑Day U.S.
FedEx FedEx Standard Overnight® One‑day shipping One‑Day U.S.
FedEx FedEx Priority Overnight One Rate® One‑day shipping One‑Day U.S.
FedEx FedEx Standard Overnight One Rate® One‑day shipping One‑Day U.S.
Varies One‑day shipping One‑day shipping One‑Day U.S.
UPS UPS 2nd Day Air Expedited shipping Two‑Day U.S.
FedEx FedEx 2Day® Expedited shipping Two‑Day U.S.
FedEx FedEx 2Day One Rate® Expedited shipping Two‑Day U.S.
USPS USPS Priority Mail Expedited shipping Expedited U.S.
USPS USPS Priority Mail Flat Rate Envelope Expedited shipping Expedited U.S.
USPS USPS Priority Mail Flat Rate Padded Envelope Expedited shipping Expedited U.S.
USPS USPS Priority Mail Small Flat Rate Box Expedited shipping Expedited U.S.
USPS USPS Priority Mail Medium Flat Rate Box Expedited shipping Expedited U.S.
USPS USPS Priority Mail Large Flat Rate Box Expedited shipping Expedited U.S.
USPS USPS Priority Mail Regional Rate Boxes(A&B) Expedited shipping Expedited U.S.
FedEx FedEx Express Saver® Expedited shipping Expedited U.S.
FedEx FedEx Express Saver One Rate® Expedited shipping Expedited U.S.
Varies Expedited shipping Expedited shipping Expedited U.S.
USPS USPS First Class Mail Standard shipping Expedited U.S.
UPS UPS 3 Day Select Standard shipping Expedited U.S.
UPS UPS Ground Standard shipping Expedited U.S.
FedEx FedEx Ground Standard shipping Expedited U.S.
FedEx FedEx Home Delivery Standard shipping Expedited U.S.
Varies Standard shipping Standard shipping Standard U.S.
USPS USPS Parcel Select Economy shipping Standard U.S.
USPS USPS Media Mail Economy shipping Standard U.S.
Varies Economy shipping Economy shipping Standard U.S.
Offering expedited shipping, either as your preferred/regular method or as an option, can make products more attractive to buyers, since they can have a choice of shipping as well as more control over their buying patterns. 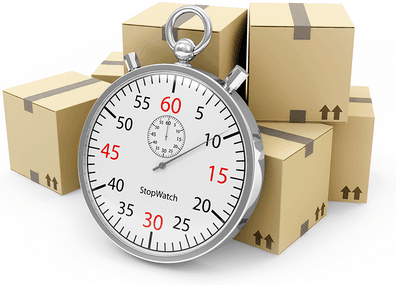 Regardless of the shipper(s) you use, never assume that “expedited” is the fastest under their definition or terms of service, since in many cases it is just a level up from the standard or economy options, especially if same‑day or overnight shipping is offered. Similarly, if a buyer convos you about “expedited” shipping, be sure to ask about the requested time frame and explain the levels, and costs, of the shipper you use. Be precise in your communications with customers about which shipping carrier you choose, when you’ll ship, the service you use, and the expected delivery time frame. For example, state if you ship every day, only on weekdays, or on certain days of the week. When you outline the benefits of expedited shipping, provide specific information about how it differs from standard shipping. Be mindful of marketplace messages.